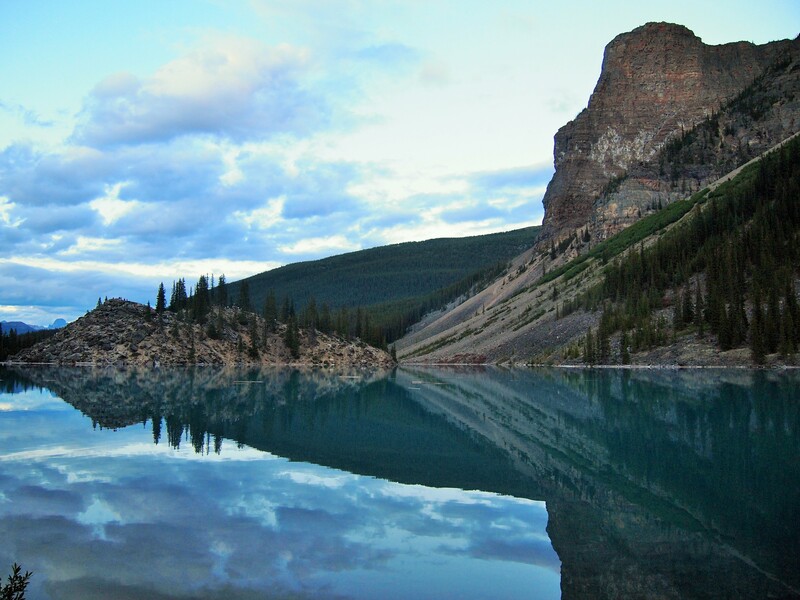 When I pulled off the Trans-Canada Highway for Lake Louise I was surprised by what we found. I assumed there would be a small town similar to Waterton, but the village of Lake Louise is little more than a strip center. All of the shops – small grocery, post office, liquor store, bakery, souvenir shops – are located on one corner which means the parking lot and four-way intersection get particularly busy. I was unprepared for the chaos once we exited the highway, but we managed to figure out where to go. We checked in at the campground first and set up our site. The campground at Lake Louise was – by far – our least favorite of the entire trip. The campground is divided into two sections: soft-sided (tents) and hard-sided (RVs). I liked that aspect, but that was where the positives ended for me. Each tent loop was tightly packed with sites, so that each one felt incredibly close to its neighbors. Coming from Wabasso where the bathrooms were heated, well lit, and spacious, the bathrooms here were in desperate need of an update. Our bathroom was shared with an adjoining loop which meant dozens of campers had to share a cramped space with only two sinks and two stalls. When I used the bathroom the next morning, it was clear I had barely edged out other early risers in getting use of the sink. 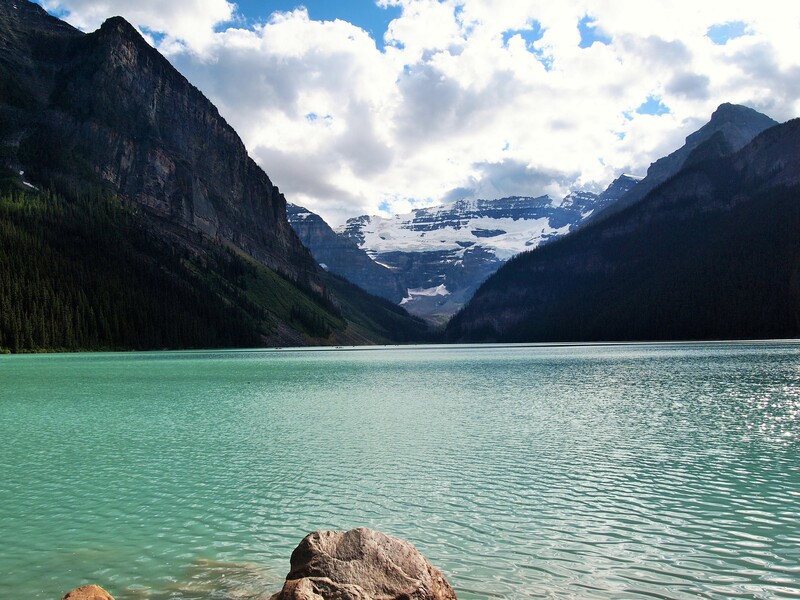 As much as we didn’t like the site, it served its purpose in providing a one-night base to explore the Lake Louise area. After we set up (I forgot to take a picture! ), we wanted to get something to eat. Zach made the wrong turn coming out of the campground and instead of going toward the strip mall, we headed to Lake Louise. We embraced the mistake and continued toward the lake. Surprisingly, we didn’t have any trouble finding a spot in the large parking lot. It wasn’t as busy as I thought it would be – since it was after 6pm, I guess we had dodged the larger crowds – but it wasn’t calm either. We made the short walk from the lot to the lake front and suddenly, there it was, Lake Louise. 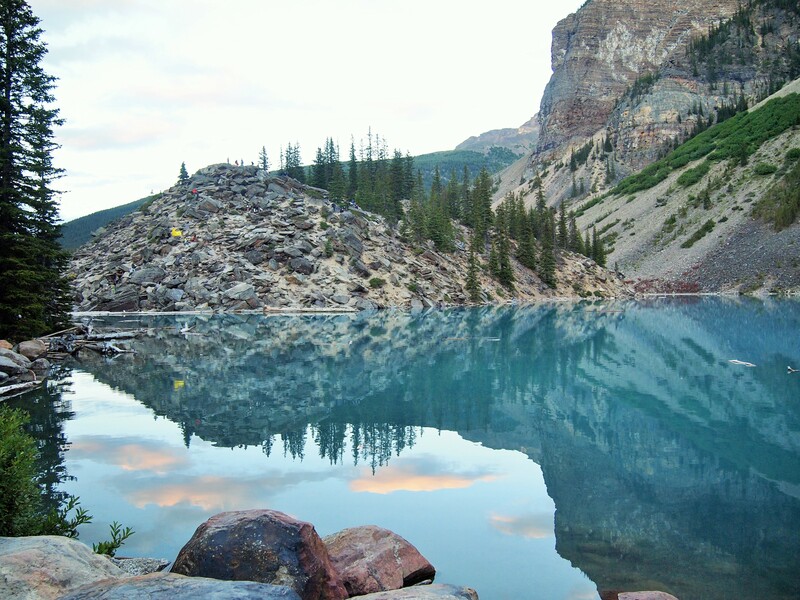 Called the Lake of Little Fishes by the Stoney Indians, it was named Emerald Lake by its first white visitor, Tom Wilson, in 1882. The name was changed two years later to honor Queen Victoria’s daughter, Princess Louise. 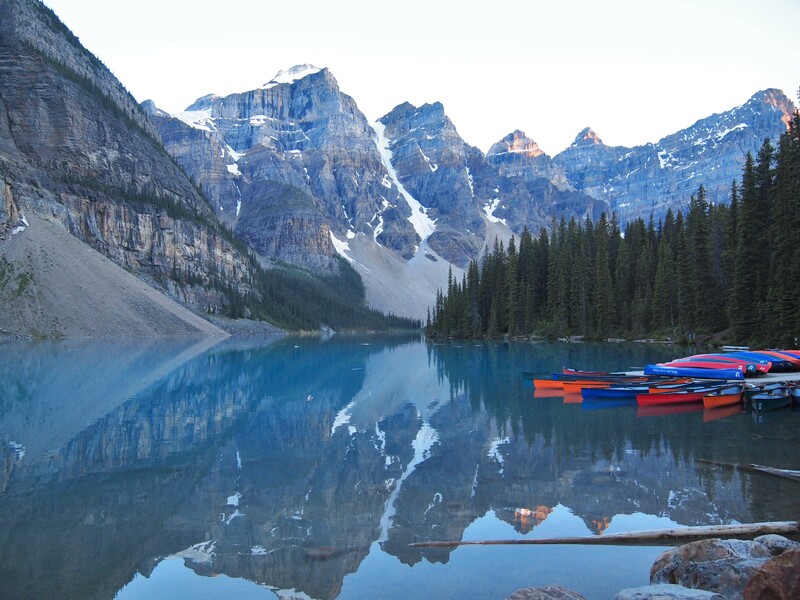 Visited by roughly 10,000 people each day during the summer months, Lake Louise is arguably Banff NP’s most famous sight. I was prepared for large crowds, but I didn’t anticipate being underwhelmed. Lake Louise was not as stunning as I thought it would be. Maybe it’s because Zach and I have hiked to so many alpine lakes in the last few years, but the lake didn’t evoke the awe I thought it would. 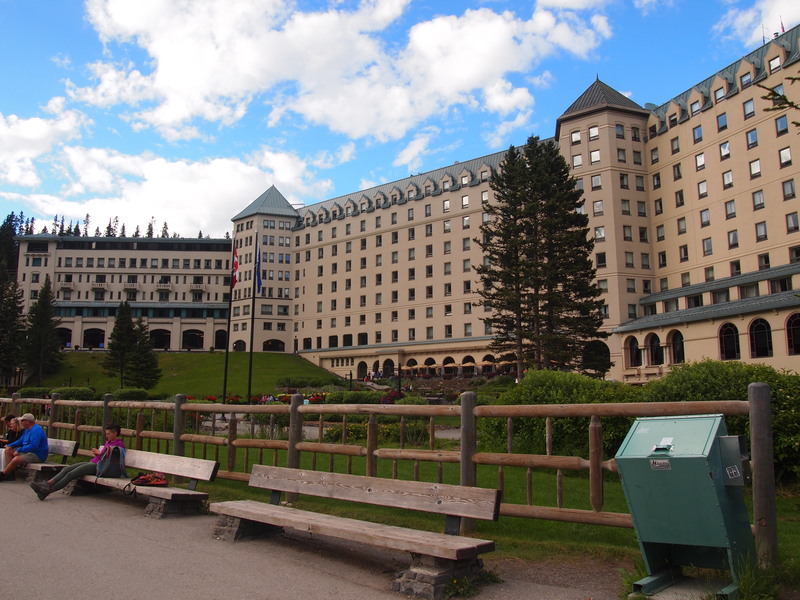 We decided to check out the Fairmont Chateau Lake Louise after gawking at the lake and taking several photographs. The hotel is massive, and it’s a little disorienting if you enter from the lakeside doors. Eventually we found the main lobby and commandeered some comfy chairs while we used the wifi. I popped into a souvenir shop to buy some postcards as well. In using the hotel’s wifi we discovered that rain/thunderstorms were in the forecast for the following afternoon. Of course it was; the rain was following us from Jasper! I had planned for us to do one of the hikes from Lake Louise, but I didn’t really want to hike in the rain anymore or get caught in another lightning storm. We decided to get up early and start the hike by 7am to give ourselves enough time to get up and down before the storms. After we finished using the wifi, we decided to grab dinner in the village and then return to Moraine Lake. We picked one of the cheaper places in our guidebook – Bill Peyto Cafe – and arrived at peak dinner time. There was a short wait, and we were starving once we were finally seated. The cafe is attached to a hostel and it seemed that most of the diners were staying there. We each had a burger and a pint which fit the bill. Afterwards we drove back up toward Lake Louise. Going to Maligne Lake near sunset had served us well, and we hoped the strategy would work again. 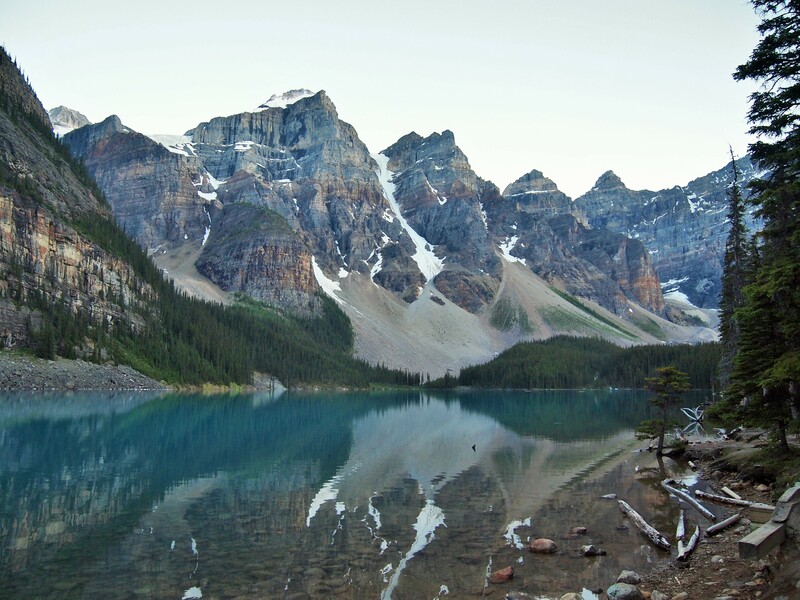 Moraine Lake is at the end of a winding, narrow road eight miles off Lake Louise Drive. Since the parking lot is small, during peak hours there is an attendant stationed at the turnoff to keep the road closed when the lot is full and to allow cars in as others leave. We had no trouble finding a spot in the parking lot at 9pm and, while there was still a decent amount of people out and about, it was probably a fraction of the crowds during the middle of the day. 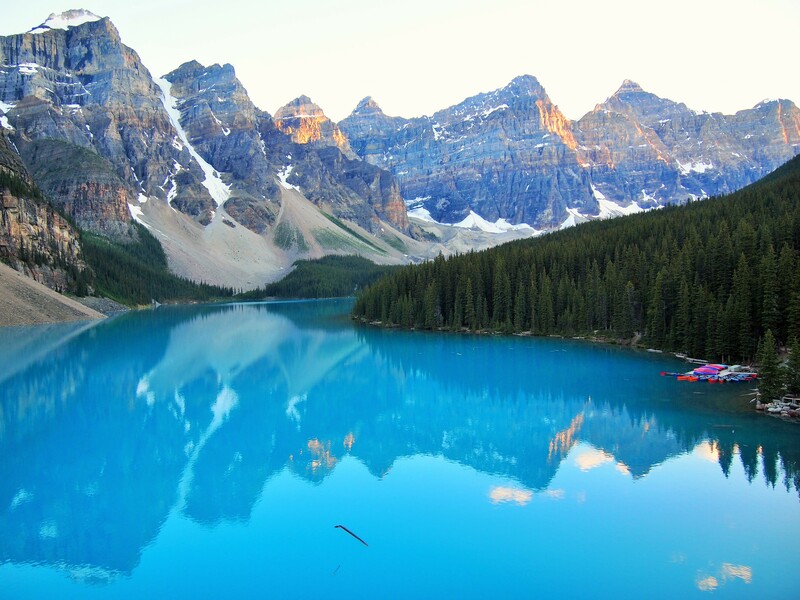 Moraine Lake is tucked into the Valley of Ten Peaks, an unimaginably gorgeous setting. Simply walking to the lake’s edge does not give you the view most people have seen though. For that view, you need to climb to the top of the rock pile. 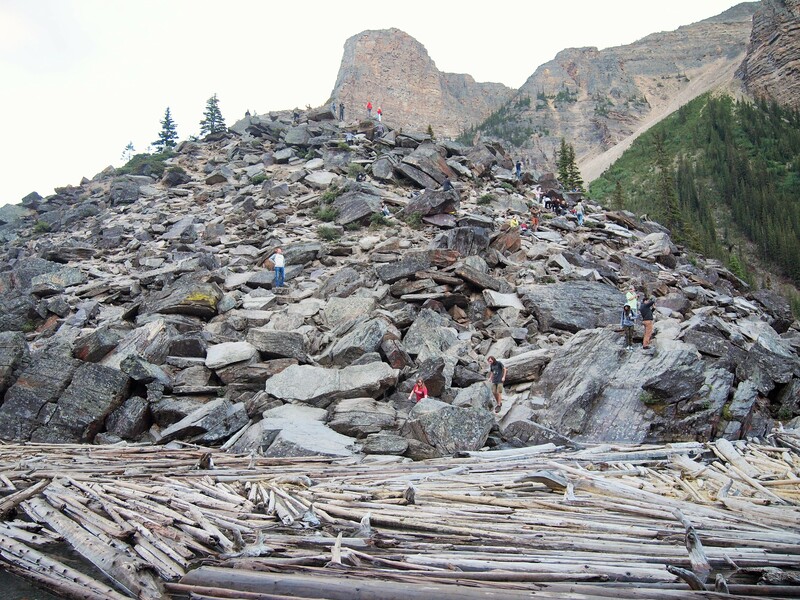 What we didn’t know at the time is that there is an actual trail to the top, but many people forgo that (or don’t know like us) and instead cross a giant log jam and then scale the rock pile to the top. I wasn’t up to it – it had been a LONG day – but Zach was, so he took my camera and ventured to the overlook. Your view if you don’t climb the rock pile – not bad! When Zach returned, we followed the trail around the northern shore of the lake for a little while. 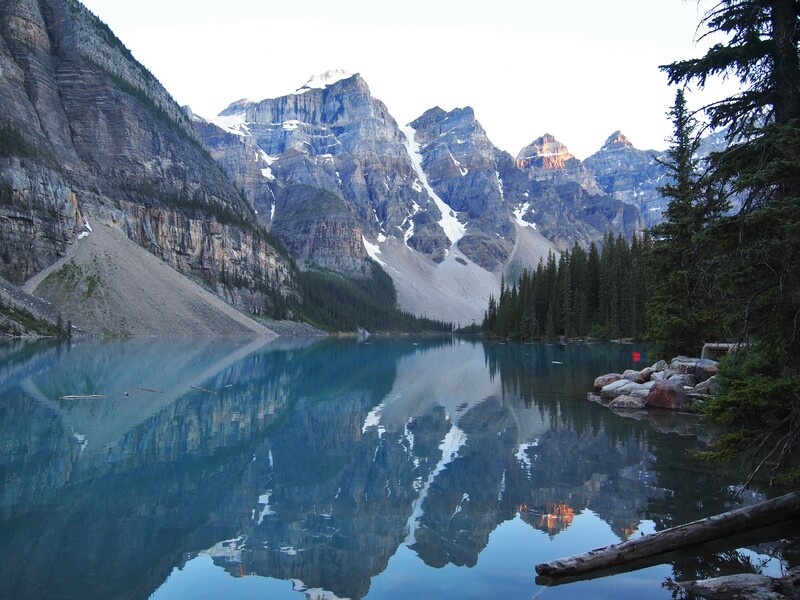 There is no bad view of Moraine Lake. The glow of the lake was magical and the surrounding peaks glistened in the last light of the day. Clearly our strategy worked. I wish we would’ve had more time to use our kayaks to get away from the shoreline, but it leaves something to look forward to next time. There are certainly other places in Banff NP where it’s easier to find solitude and seclusion, yet I’m glad we were able to visit both iconic lakes. I would return but only with the aim of doing several of the incredible day hikes in the area. I’d also spend the extra money to sleep in a bed and avoid the lackluster campground. While I enjoyed our brief time in the Lake Louise area of Banff, I was happy to leave the masses behind after our hike the next day. Have a brassy Easter, y’all.